In Why is it MINE to decide?, I explored why you, the boss, are best-suited to be making the tough calls. Now let’s look at HOW to do that more effectively – less difficultly. Many bosses are responsible enough, but still avoid ‘hitting things Head On.’ Why? Because they’re often not used to taking appropriate, timely, and decisive methods…SOONER, rather than later. Oh, they might THINK they’re being timely; they might FEEL they’re being decisive; but if really thought about it, they’d realize that their impact is decidedly NOT ‘hitting things Head On’ – and it’s noticeable. INTENSITY – “If your crisis runs the risk of escalating in intensity, how intense might it get, and how quickly?” – What degree of intensity can you or your company endure, and for how long? What, in your opinion constitutes ‘intense’? A flood of angry telephone calls? A burst of vitriolic hate mail? Mass resignation from employees? A sudden rise in your blood pressure? A suspicious pattern of canceled customer orders? You are the only one who can determine what levels or degree of intensity are acceptable. Fink suggests you rate the situation’s INTENSITY from 0 to 10 (with 0 being lowest and 10 being highest). SCRUTINY – “To what extent would your crisis fall under someone’s watchful eye?” – When problems occur, it’s rare that no one else sees them. Your boss? Influential executives? Human Resources, Legal, Compliance, Accounting? Customers? Vendors? Competitors? The press? operates in a vacuum. Stakes holders? Fink suggests you rate the situation’s SCRUTINY from 0 to 10. 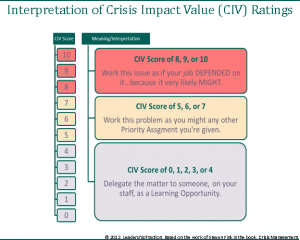 IMPACT – “To what extent would your crisis interfere with the normal operations of your business?” – Might it affect your ability to get your product or service to market on time, or at all? Might you run short of stock or have too much inventory? Is it possible that you will have to spend so much time dealing with the crisis that you will be unable to tend to other more routine functions of your job properly? Fink suggests you rate the situation’s IMPACT on normal business operations from 0 to 10. REPUTATION – “Are you (your team, department, company, etc.) the victim or the culprit?” – Knowing the difference will help you determine what collateral damage might occur be to your reputation. Fink suggests you rate the extent to which your reputation would be damaged if this situation is handled poorly and rate it from 0 (no damage) to 10 (severe damage). COST – “To what extent would your company’s ( or division’s or whatever) bottom line be damaged?” – Hard and soft dollars together, score, as before, from 0 (no cost) to 10 (crippling cost). 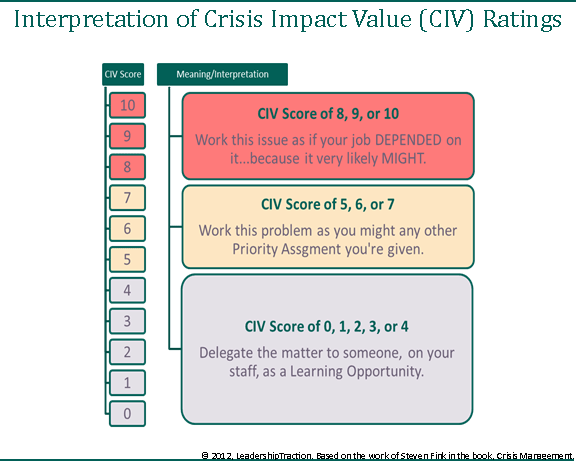 Now total your five scores and divide by 5 to get what Fink calls your Crisis Impact Value, of CIV. You now have a quantitative number that forecasts an issue’s INTENSITY, level of SCRUTINY it’s likely to receive, IMPACT on normal operations, potential damage to your REPUTATION or career, and COST to the business. As such, it also defines the level-of-attention it both deserves…and REQUIRES. Knowing the impact matters. It simplifies. It clarifies.